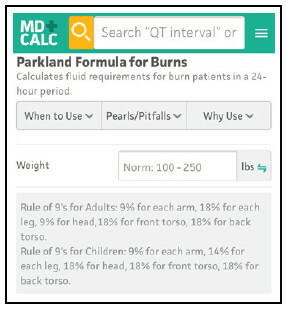 The Parkland formula for burns calculates fluid requirements for burn patients in a 24-hour period. The Parkland formula is a validated and effective approach to initial fluid resuscitation in the acutely burned patient. Overly aggressive fluid resuscitation, termed "fluid creep," is well documented in critical care literature. Factors that may lead to fluid creep include lack of physician observation of endpoints (ie, urine output), increased opioid use, and the emergency nature of goal-directed resuscitation. Patients with inhalational and electrical burns, as well as children and the elderly, may require more or less fluid resuscitation than is predicted by the Parkland formula. The Parkland formula has been endorsed by the American Burn Association. It has been shown to appropriately restore intravascular volume and limit the development of hypovolemic shock. Use the Parkland formula for patients with acute burns. Urine output: 0.5 mL/kg/hr in adults (50-100 cc/hr) and 0.5 to 1.0 mL/kg/hr in children weighing < 30 kg. Heart rate: A heart rate of < 110 bpm in adults usually indicates adequate volume. Narrowed pulse pressure provides an earlier indication of shock than does systolic blood pressure alone. Monitoring blood pressure by arterial catheter is superior to cuff pressures because of the interference of tissue edema. The radial artery is the first choice, followed by the femoral artery. Serum lactate is a strong predictor of mortality, and trends can be utilized to determine hemostatic status; however, it should not be used as an independent predictor of adequate fluid resuscitation. Partial-thickness burns to > 10% of total body surface area. In pediatric patients, this can be calculated using the Rule of Nines for children: 9% for each arm, 14% for each leg, 18% for the head, 18% for the front torso, and 18% for the back torso. Alternatively, the Lund and Browder chart can be used to calculate an age-based estimation. It is important to remember that all resuscitation formulas should only be used as guides. Patients should be assessed frequently, with individual adjustments made to maintain adequate organ perfusion. Blumetti et al (2008) conducted a retrospective study of patients resuscitated with the Parkland formula at a single institution over 15 years to determine the accuracy of the formula in guiding resuscitation. Using urine output as a guideline for adequate resuscitation, they found that patients commonly received fluid volumes higher than predicted by the Parkland formula, and concluded that the formula should represent a resuscitation “starting point,” but urine output is the most important parameter to control resuscitation volume. Cartotto et al (2002) performed a retrospective study, and also found that the Parkland formula underestimated the volume requirements in most adults with burns, especially in those with large full-thickness burns. Thus, the Parkland formula is a validated and effective approach to initial fluid resuscitation in the acutely burned patient (Baxter 1974, Cartotto 2002, Blumetti 2008). Read more about Dr. Baxter. Baxter CR. Fluid volume and electrolyte changes in the early post-burn period. Clin Plast Surg. 1974;1:693-703. Cartotto RC, Innes M, Musgrave MA, et al. How well does the Parkland formula estimate actual fluid resuscitation volumes? J Burn Care Rehabil. 2002; 23(4):258-265. Blumetti J, Hunt JL, Arnoldo BD, et al. The Parkland formula under fire: is the criticism justified? J Burn Care Res. 2008;29(1):180-186. American Burn Association Practice Guidelines. Available at: http://www.ameriburn.org. Accessed March 14, 2018. Ahrns KS. Trends in burn resuscitation: shifting the focus from fluids to adequate endpoint monitoring, edema control, and adjuvant therapies. Crit Care Nurs Clin North Am. 2004;16(1):75-98. Ahrns KS, Harkins DR. Initial resuscitation after burn injury: therapies, strategies, and controversies. ACN Clin Issues. 1999;10(1):46-60. Jeng JC, Jablonski K, Bridgeman A, et al. Serum lactate, not base deficit, rapidly predicts survival after major burns. Burns. 2002;28(2):161-166. Hettiaratchy S, Papini R. Initial management of a major burn: II—assessment and resuscitation. BMJ. 004;329(7457): 101-103. Access a Pediatric Emergency Medicine Practice issue reviewing emergency management of pediatric burn patients. Describe the role of a pediatric emergency transport team in providing immediate and continuing critical care while in transfer to a tertiary care facility. Discuss the benefits and challenges of various transport modalities. Explain the transport environment and its unique limitations in team communication, patient assessment, and administration of care. Discuss the controversies and developing areas of research in interfacility transport. Date of Original Release: April 1, 2018. Date of most recent review: March 15, 2018. Termination date: April 1, 2021.
Credit Designation: EB Medicine designates this enduring material for a maximum of 4 AMA PRA Category 1 CreditsTM. Physicians should claim only the credit commensurate with the extent of their participation in the activity. ACEP Accreditation: Pediatric Emergency Medicine Practice is also approved by the American College of Emergency Physicians for 48 hours of ACEP Category I credit per annual subscription. AAP Accreditation: This continuing medical education activity has been reviewed by the American Academy of Pediatrics and is acceptable for a maximum of 48 AAP credits per year. These credits can be applied toward the AAP CME/CPD Award available to Fellows and Candidate Fellows of the American Academy of Pediatrics. AOA Accreditation: Pediatric Emergency Medicine Practice is eligible for up to 48 American Osteopathic Association Category 2-A or 2-B credit hours per year. Goals: Upon completion of this activity, you should be able to: (1) demonstrate medical decision-making based on the strongest clinical evidence; (2) cost-effectively diagnose and treat the most critical ED presentations; and (3) describe the most common medicolegal pitfalls for each topic covered. Discussion of Investigational Information: As part of the journal, faculty may be presenting investigational information about pharmaceutical products that is outside Food and Drug Administration approved labeling. Information presented as part of this activity is intended solely as continuing medical education and is not intended to promote off-label use of any pharmaceutical product. Faculty Disclosures: It is the policy of EB Medicine to ensure objectivity, balance, independence, transparency, and scientific rigor in all CME-sponsored educational activities. All faculty participating in the planning or implementation of a sponsored activity are expected to disclose to the audience any relevant financial relationships and to assist in resolving any conflict of interest that may arise from the relationship. Presenters must also make a meaningful disclosure to the audience of their discussions of unlabeled or unapproved drugs or devices. In compliance with all ACCME Essentials, Standards, and Guidelines, all faculty for this CME activity were asked to complete a full disclosure statement. The information received is as follows: Dr. Gallegos, Dr. Prasad, Dr. Lowe, Dr. Patterson, Dr. Williamson, Dr. Claudius, Dr. Horeczko, Dr. Mishler, and their related parties report no significant financial interest or other relationship with the manufacturer(s) of any commercial product(s) discussed in this educational presentation. Dr. Jagoda made the following disclosures: Consultant, Daiichi Sankyo Inc; Consultant, Pfizer Inc; Consultant, Banyan Biomarkers Inc; Consulting fees, EB Medicine. Commercial Support: This issue of Pediatric Emergency Medicine Practice did not receive any commercial support. Earning Credit: Two Convenient Methods: (1) Go online to www.ebmedicine.net/CME and click on the title of this article. (2) Mail or fax the CME Answer And Evaluation Form with your June and December issues to Pediatric Emergency Medicine Practice. Hardware/Software Requirements: You will need a Macintosh or PC with internet capabilities to access the website. Additional Policies: For additional policies, including our statement of conflict of interest, source of funding, statement of informed consent, and statement of human and animal rights, visit https://www.ebmedicine.net/policies.